The GTI Asia China Expo 2014 encourages businesses opportunities within China, as well as promotes partnerships with other industry professionals and companies outside of China. Due to the rapid development of the Chinese economy and its increasing influence on the global economy, the China market attracts a lot of operators' attention. As one of the four "BRIC Nations," China has great business opportunities, which a lot of international businesses have set their eyes on, particularly in the gaming business, with two beneficial new policies, "Electronic Arcade Management Regulation" and "Electronic Arcade Special Zone." As a result, the need for amusement/ gaming machines has increased dramatically. The market has shown promising prospects, and its future development is closely watched by businessmen in this sector around the world. The 6th GTI Asia China Expo that is organized by Haw Ji Co., Ltd. will be held from August 22~24, 2014 at the Halls 1.1&6.1, A Zone, China Import and Export Fair Pazhou Complex, Guangzhou City in Guangdong Province, China. This is the best platform for those who want to enter the Chinese market and purchase Chinese products. China, with a vast territory and abundant resources has immense needs for entertainment; the government's liberal policy on the comic industry activated the development of game industry. More and more manufacturers from Taiwan, Japan, Korea and Hong Kong set up factories in China, or cooperate with Chinese manufacturers in order to expand the market. Highway Games to Exhibit Exclusive Ocean King and King of Treasures Games at GTI China! 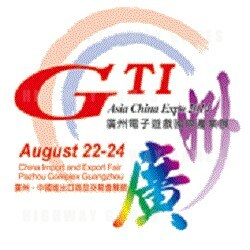 GTI Asia China Expo 2014 Opening Next Friday 22nd!